We’re not a vodka household. We’re much more fond of gin, thank you very much. But I always seem to have a bottle of vodka in the liqueur cabinet for purposes other than drinking … mainly making tinctures, perfumes and handmade infused liqueurs. 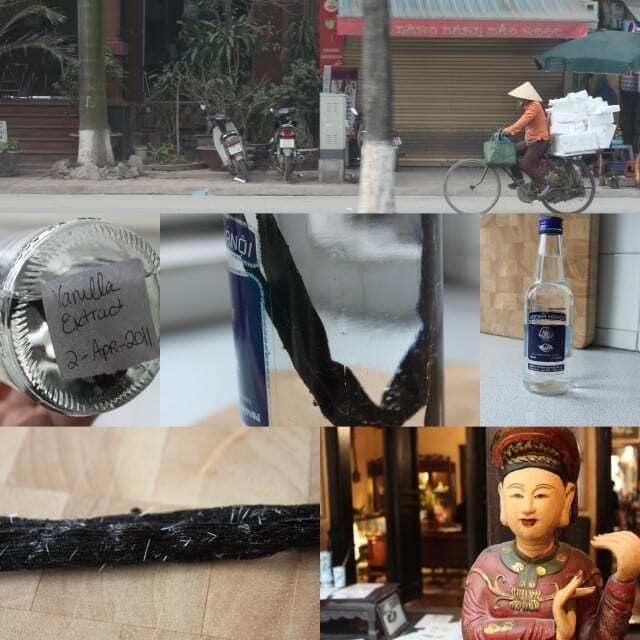 On our recent trip to Vietnam, we got this small bottle of Vodka Hanoi, and I’ve been looking for a way to use up the vodka while still keeping the bottle. I’ve been out of vanilla extract for a few weeks and have been successfully substituting random liqueurs and other flavorings where needed (Baileys, dark rum, Kahlua, even almond extract!) But this lonely bottle of Vodka Hanoi seemed the perfect excuse to turn a simple rice spirit vodka into something infinitely more useful. The recipe is simple. It’s not even a recipe, really. Just take some vodka (about 1 cup), and add 2 really nice strong vanilla beans (don’t skimp on quality! I know they’re expensive, but there are only 2 ingredients in this recipe, and the extract will last for ages.) Close the bottle and store in a dark location for at least a month, maybe more. It’s been less than a week and the vodka is already taking on that dark vanilla-y tinge. I’ll check it after 1 month, and again after 2 months and report back! Apparently commercial vanilla extracts contain sugar, but I’m not going to add any since I use my extract exclusively in sugar-filled baked goods! I plan to leave the vanilla beans in the bottle while using the extract, and to just top it up with additional vodka when needed throughout the year. I’ll report back in a few weeks! I have NO idea what’s taken me so long, but I finally put some vanilla beans and vodka in a mason jar in my pantry…can’t wait to see what happens in a few months! My only worry is I’m using vanilla beans I bought directly from the grower in Taha’a (a small island near Tahiti known for vanilla)…sounds great except I was there on my honeymoon…6 years ago…hmm. Any idea how long vanilla beans last? Worst case if they don’t work here I’ll try again with some fresher vanilla beans, and if it comes out great I’ll be so glad to have finally put them to use! I just found your site today and LOVE it! I like the idea of making my own vanilla extract, but have a concern. Because of the alcohol, I wouldn’t think this would be good to use in baking that a child would be eating. I wouldn’t worry about this myself, as you usually use 1-2 tsp. of vanilla extract in an entire batch of baking – so the alcohol each person is eating is minuscule. Also, if you are baking with it, the heat likely evaporates off the alcohol content, leaving only the flavor.